See two examples of the Marratt gallery’s work under our post entitled Detroit Guy and Detroit Woman By Marratt. 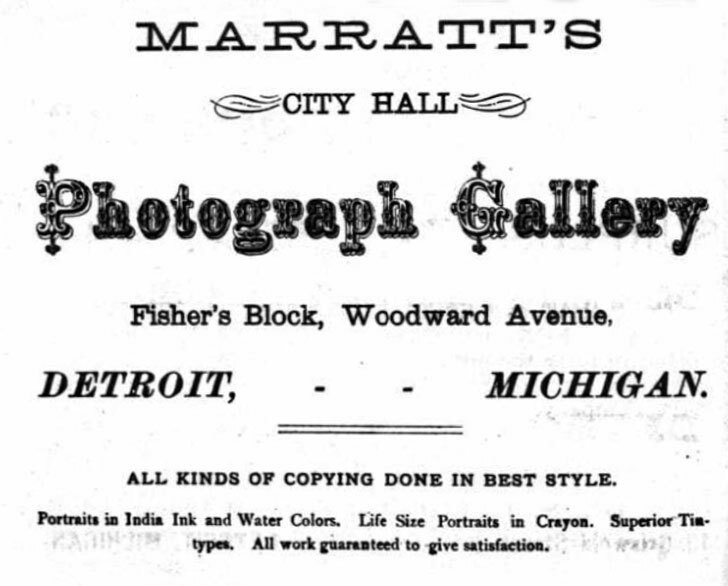 Photographer, William Marratt appears in the 1880 Detroit city directory as proprietor of Marratt’s City Hall Photograph Gallery Address for the gallery 131, 133 and 135 Woodward Ave.
1899 – William Marratt, Jr. – address 836 Grand River Ave. Death info for William Marratt not found, it appears son William has taken over his father’s business at either his father’s death or retirement. The 1880 Federal Census for Detroit, shows that William was born in England, about 1830. His wife is Eliza J., born in New York, about 1839. Their children are Ida S., born New York about 1860, occupation schoolteacher, William, Jr., born in New York, about 1864, and Nellie, born New York, about 1873. An 1863 or ’64 New York Tax record shows a charge of $25.00 for a reassessment of photographer’s license for William Marratt, location Dansville, NY. And an 1866 Tax record shows William is in Honeoye, NY (a little northeast of Dansville.) Detroit City Directories show entries from years 1875 through 1898 for William and many for William, Jr. who is listed as an entomologist on one directory and a naturalist on another. 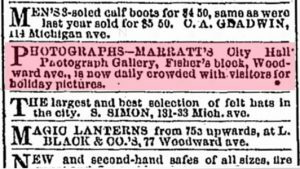 William, Jr. goes on to become a photographer, in business for many years in the Grand Ledge MI area (Eaton and Clinton counties) however most likely he had taken over the business from his father, as of about 1899 (per city directories). Sources: J. W. Weeks & Co.’s Detroit City Directory for 1875-1876, p. 126. Ancestry.com. U.S. City Directories, 1822-1995. Michigan Deaths and Burials, 1800–1995. (Ancestry.com). J. W. Weeks & Co.’s Detroit City Directory for 1882, p. 685. Ancestry.com. U.S. City Directories, 1822-1995. 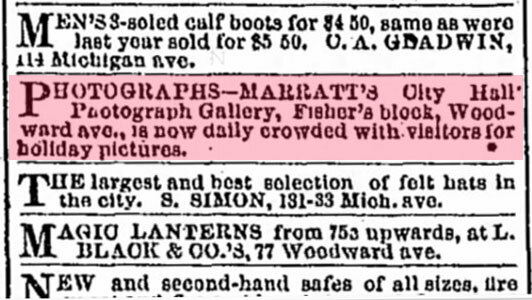 1874 advertisement. Detroit Free Press, Sunday, p. 3. (Newspapers.com). “Funeral Rites For Grand Ledge Pioneer.” Lansing State Journal. December 13, 1948, p. 2. (Newspapers.com). R. L. Polk & Co.’s Detroit City Directory, 1895. p. 2006. Ancestry.com. U.S. City Directories, 1822-1995. R. L. Polk & Co.’s Detroit City Directory, 1899. p. 2210. Ancestry.com. U.S. City Directories, 1822-1995. 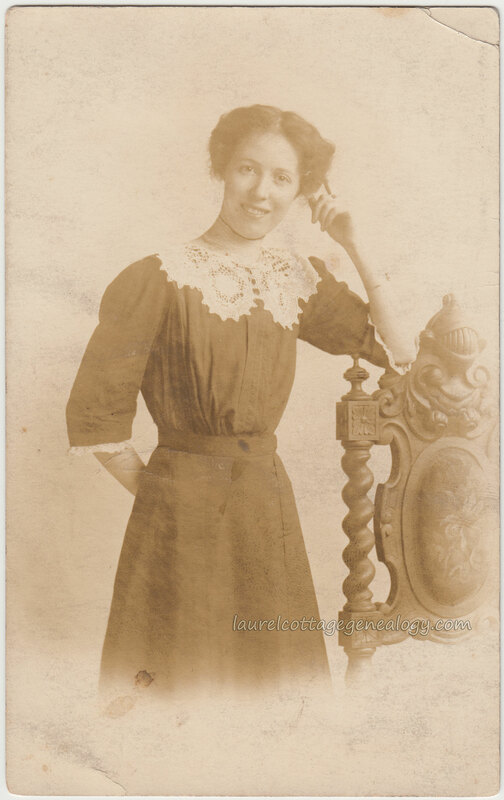 Cabinet Card, circa late 1870s – early 1880s. Photography studio: Marratt’s City Hall Photograph Gallery. Handsome guy who looks a little careworn. 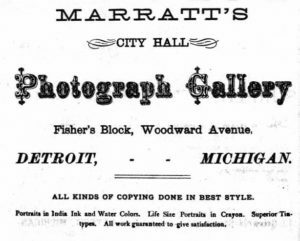 Cabinet Card photo taken by Marratt’s City Hall Photograph Gallery, 131, 133 and 135 Woodward Ave., Detroit, Michigan, proprietor William Marratt. There is nothing on the back of the card. 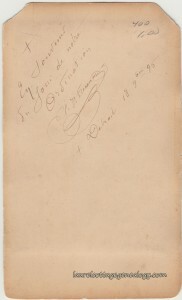 If you look very closely at the bottom left of the card you will see the photographer’s name in script; readable is the capital M, and the two t’s at the end. To the right of that is the studio address. 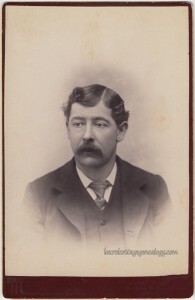 For more information on the owner of the gallery see William Marratt, Proprietor of Marratt’s City Hall Photograph Gallery. Source: J. W. Weeks & Co.’s Detroit City Directory for 1880, p. 586. Ancestry.com. U.S. City Directories, 1822-1995. 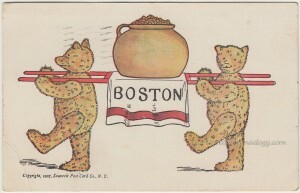 A charming teddy bear postcard which reads “Just here for over night, back home today. From Aunt Lillie” ? 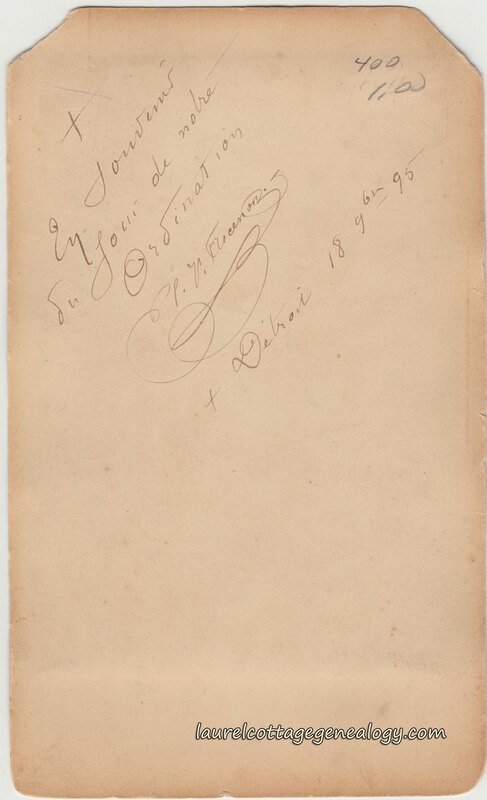 The writing is very faint on the signature. 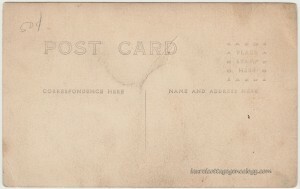 Addressed to Master Alden W. Read, 3302 N. Main, Fall River, Mass. 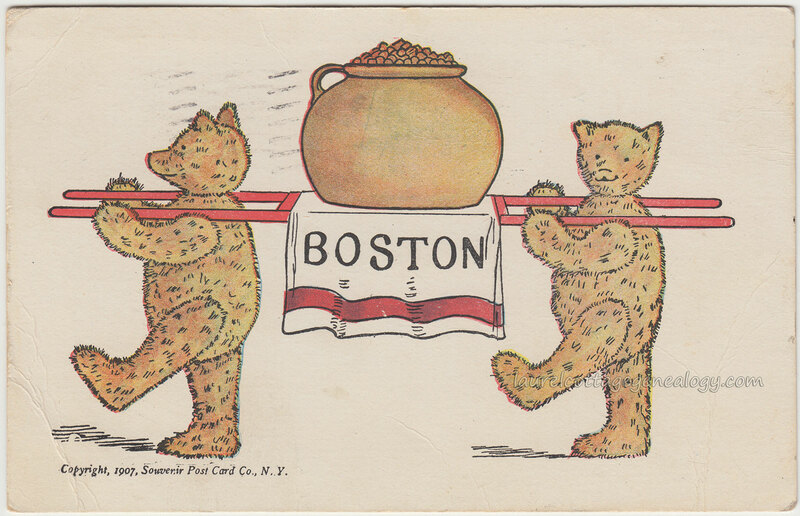 Postmarked Boston, August 4, 1907. Alden W. Read is on the 1910 Federal Census in Fall River at this address, born about 1903, with his parents Frank and Mary. More research finds Alden’s birthdate and place as February 9, 1903, Fall River. Parents Frank D. Read and Mary E. Grinnell. Divided back, used postcard. 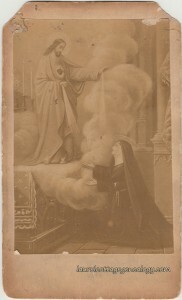 Published by Souvenir Postcard Company, New York. Copyright 1907. 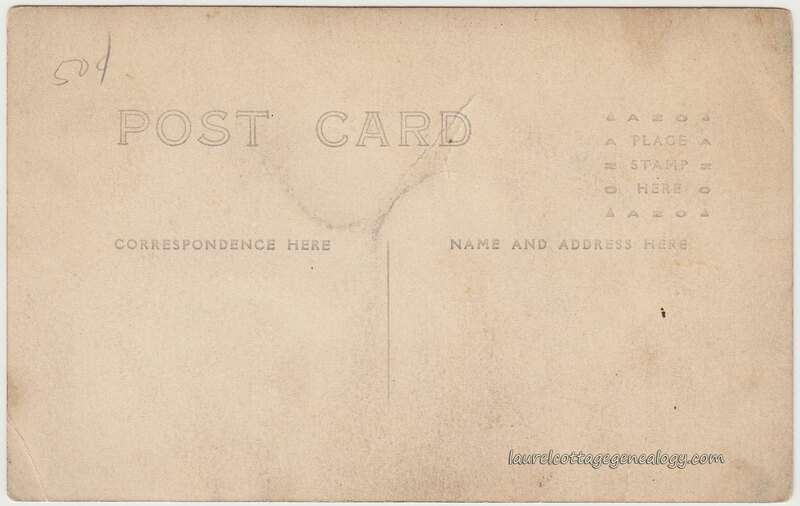 Check out the bee on the Post Card graphics. Totally cool. Beautiful young woman posing next to beautiful ornately carved wooden chair. The lace collar of her dress is heavenly. Also, note the knight’s helmet carved in the top of the chair. 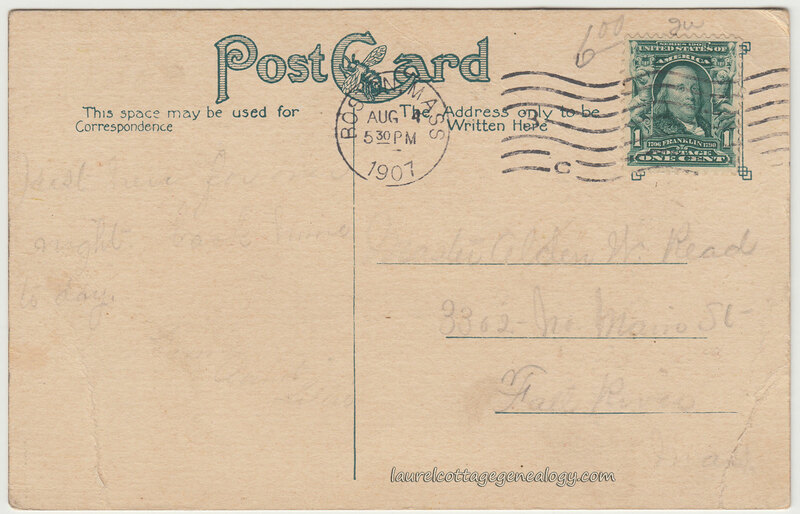 This postcard was found in St. Joe, Michigan while on a recent vacation. The woman reminds both Mom and I of Loretta Young. 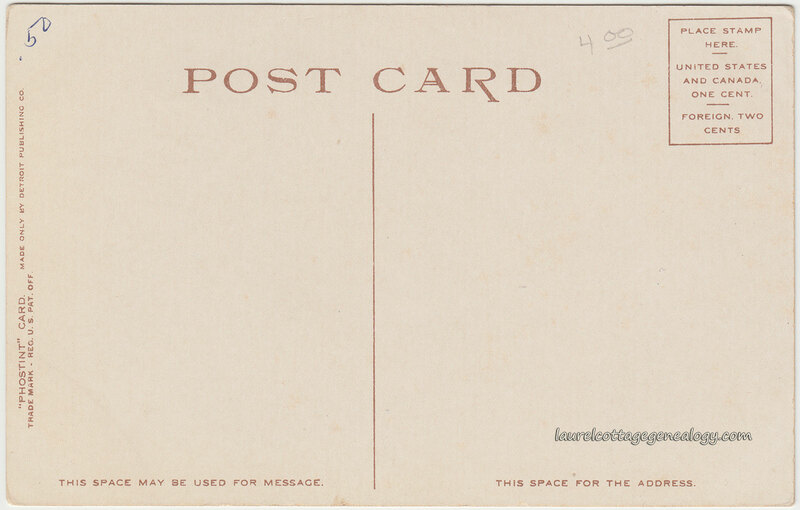 Real Photo Postcard, divided back, unused. AZO stamp box. 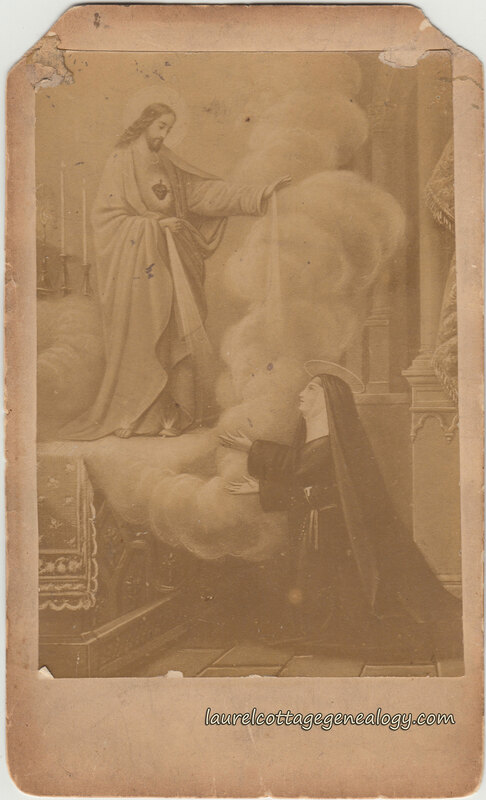 Circa 1907 – 1918. It’s not clear which Hiawatha this is supposed to be. 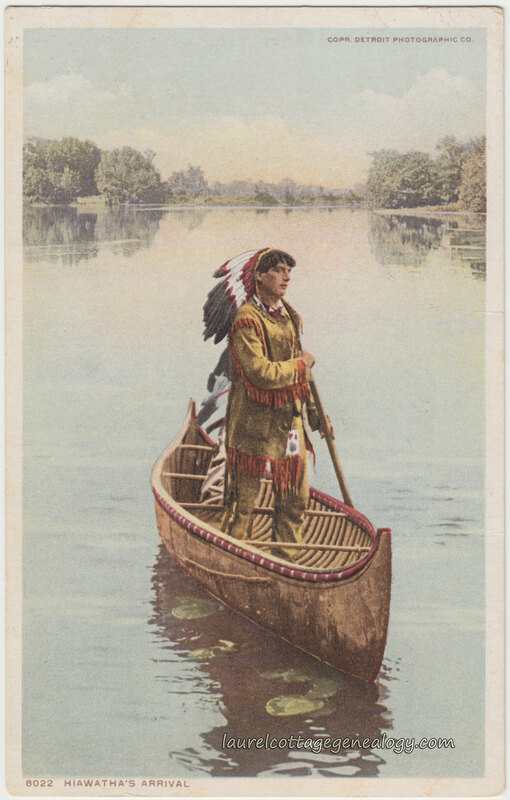 There is the Hiawatha, fictional Ojibwe character in the epic poem Song of Hiawatha, by Henry Wadsworth Longfellow, and the Hiawatha who helped unify the Iroquois confederacy. Longfellow’s story was set along the shores of Lake Superior, some accounts say in Minnesota, while others say Michigan. Longfellow studied the writings of Henry Rowe Schoolcraft, an Indian agent, ethnologist, and explorer, as well as other writings regarding American Indians. The poem, first published in 1855 became immensely popular, and has been analyzed, critiqued and memorized, (at least in part) although is probably not much studied today. When I worked for a brief part of a summer on Mackinac Island in the late ’70’s, I one night took a midnight moonlit bike ride with a fellow worker, around the island (no cars there) while he recited part of this poem. I believe he told me he had memorized it for school, but I’m not sure about that part. I didn’t know at that time how extremely long the poem actually is so I’m assuming he did not memorize the whole thing! The Hiawatha of the Iriquois confederacy has been said to by some accounts to have been born Onondaga but later adopted by the Mohawk. (or vice versa) This Hiawatha lived sometime between the 11th and 15th centuries, and was instrumental in the forming of the Five Nations. The Five Nations are the people of the Seneca, Cayuga, Onondaga, Oneida and Mohawk nations who lived in the area of New York State and Pennsylvania, and were often at war with one another until being persuaded to follow the teachings of a legendary figure who came to be referred to as The Great Peacemaker. The Great Peacemaker was by some accounts a Huron prophet, and is said to have converted Hiawatha to his teachings. Hiawatha was known as a great orator, and thus able to be very influential in bringing about the union of the Five Nations. The Five Nations later became The Six Nations when the Tuscarora joined in 1722. 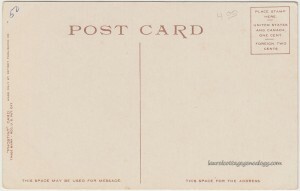 Divided back, white border, unused postcard. Circa 1915 – 1930. Published by the Detroit Publishing Company, No. 8022. “Photostint” card.